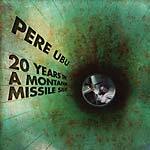 "Pere Ubu have really come out fighting with Why I Hate Women, racing towards all horizons at full tilt, pushing the experimental envelope further than ever, but also tightening up their trademark avant-punk attack. If St Arkansas saw them rooting around furtively in rock's darkest, dankest corners, on Why I Hate Women Ubu seem to illuminate these secret spaces with firework displays and thousand-watt searchlights. The rhythm section (Ubu's longest serving) of bassist Michele Temple and drummer Steve Mehlman is tauter and leaner than ever before. Robert Wheeler's bravura performance on vintage electronics has him coming over as rural Ohio's answer to Sun Ra, splattering analog synth and theremin all over the music with wild, visionary abandon. Guitarist (and newest recruit) Keith Moliné veers between wayward sonic expressionism and disciplined garage thrust. At the eye of the storm is singer David Thomas, a true rock maverick at the height of his powers. His vocal approach shows a startling new melodicism, a plaintive purity of expression that cuts through his familiar repertoire of radical voicings and techniques. Lyrically he manages to balance stormy obsessiveness with flashes of playful wit, refracting standard rock themes (love and obsession) through the looking glass of his boundless imagination."